It’s been bugging be for some time now. How is it we are already 7 years into the smartphone era, and yet we still use operating systems that are based on the same old metaphor of the desktop. Actually, while this metaphor is pretty solid for a person sitting in front of a big screen with keyboard and mouse, it feels clumsy and irrelevant for a a person in motion with a minute to spare. All this swiping gestures to move between the various desktop screens, searching for a specific app are just a waste of time. Folders make it even worse. It’s way to much work to find the app or the content you need in a context of mobile use. We’ve got dozens and dozens of apps on our device, remembering their location is way too hard. You open the search type a few characters and then finally – you found it. I know, there are people, who will invest the time, and manage their smartphone apps, move apps between desktop screens and folders, and will have a clean and tidy “system”. But I believe most of us don’t. And why should we? 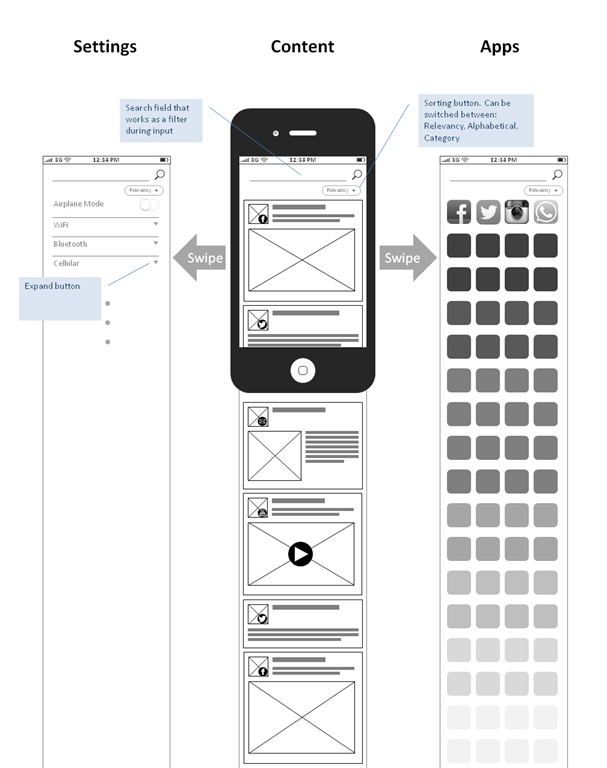 While the task-focused scenario is relevant for mobile, there are also other common scenarios. For instance, I’m waiting for a bus (or to the doctor, or the train to get to my destination), and I open the device, just because I’m bored. I want to be entertained, view some content (we have so much potential content). What happens? I start swiping back and forth, see the notification badge on Facebook and open the app… and that’s it (we all know what happens after that). We live in a world of almost endless apps and endless content, therefore we need to build new OS on endless-content solutions. Mobile operating systems don’t need more upgrades, they need a paradigm shift. Focus on relevancy (context) – our smartphones are the most intimate piece of technology we ever had. It can – and it should – learn how be a smart companion, be aware of context, understand our patterns, and help us with the best possible suggestions. Content – This is an aggregator of content that is shown as a feed of interactive “tickets”. It contains post from Faceook, tweets from Twitter, news from my favorite blogs and news site, email messages. No notifications that redirect the user into an app, but the content right there. Not only a user can consume content in this screen, he can also Like, Retweet, enter a comment, and maybe even write a new post. This is the main “screen”. Apps – This is a list of my installed apps. Many of these apps might not be opened, and only appear as a widget in the content screen. And yet, some apps need full immersion (specific games, spreadsheet, etc). This will be the place to search them. Moreover, this is also a good place for app discovery. If I don’t have the app I am searching for, how about showing relevant apps to download? Settings – I hate settings. Both in iOS and Android. I never remember the exact structure. This screen will be based on expandable items, that make it easier to navigate and search for the setting I want to change. There might other pillars, that are not depicted here. For instance, productivity focused pillar, where you can see tasks, schedule meetings, etc. Switching between pillars is easy – just swipe left or right. We are already used to this interactions, only now we can move between different modes, and just wonder around to find a specific icon. Search box – this is a critical functionality that should always stay at the top of the screen. This should make it easy to filter out the content, the app, the setting or the settings item. Relevancy – this is a background feature, that should learn the user behavior (based on geography, time, and more), and be able to sort the content in the most relevant way: to show the content or app that the user will be most interested in right now. This will save us time in searching what we want. It’s a rough idea, and far from being a validate concept. I didn’t get deep into researching all relevant users, most common scenarios, but based it on my own pains, and my own patterns. And yet, although this is not a final product in any way, it might be a starting point to rethink, redefine and redesign the old and problematic model we are so used to working with. Think this is a bad idea? Have a better one? I will be happy to hear your thoughts.